The Victorian Lifestyle: Imagine living during the Victorian era when social behavior was ruled by the strict rules of etiquette. Learn more about the rules of conduct that governed good society, including the use of calling cards and the language of the fan. Victorian Holiday Traditions: Many of our holiday traditions have their foundation in the Victorian era, including the tradition of a Christmas Tree and sending of Christmas cards. Learn more about the impact the Victorian era had on how we celebrate Christmas today, including the impact of Charles Dickens’ A Christmas Carol. Holiday Traditions Part 2: Have you ever wondered where many of our holiday traditions came from? Get into the holiday spirit and learn more about the 12 Days of Christmas, why reindeer are associated with Christmas and other bits of trivia! Holiday Traditions Part 3: Let’s explore Hanukkah, Kwanza, Charlie Brown’s Christmas, and the symbols found in today’s Christmas ornaments. Holiday Traditions Part 4: Learn more about Old Saint Nick himself! You might be surprised to learn how old Santa is, when he got married, and who his sidekicks are! Holiday Traditions Part 5: Explore how the holidays are celebrated around the world! 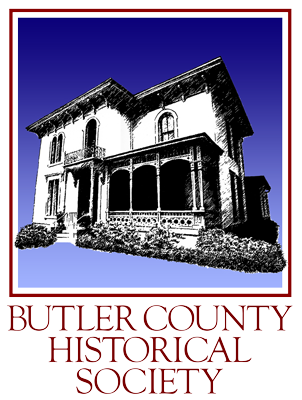 Reality and Fantasy: 150 Years of Butler County Weddings: Learn how fashions and wedding customs change as we trace 150 years of weddings in Butler County from the mid-1800s through the 1900s. Explore the history of wedding dresses and learn how white became the fashion, and learn about the celebration of the wedding breakfast. Clothing During the Great War: This talk will explore the uniforms worn by American doughboys during World War I as well as the fashions on the home front.